Scrabble games on display at Palo Alto Sport and Toy World in Palo Alto, California. One of my favorite political scientists is Stephen Ansolabehere at Harvard. I greatly admire his scholarship on elections, politics and the media, and political economy. But there is another remarkable — and almost certainly underappreciated — fact about Ansolabehere: His last name is six valid two-letter Scrabble words in a row. AN. SO. LA. BE. HE. RE. Two-letter words are the nucleotides of Scrabble; they compose its DNA. They allow long, high-scoring words, including bingos, to be hooked onto the board. They also allow potentially high-scoring “overlaps”: Words played next to each other, creating other two-letter words. (For an extreme example, suppose the word INTONER is on the board horizontally. TUATERA, a reptile, could be played right above it, forming seven two letter words in the process: TI, UN, AT, TO, EN, RE and AR.) They also provide convenient, and often high-scoring, ways to get rid of big-point tiles — ZA, QI, XU, JO and the like are some of the most-often-played words in the competitive game. An aspiring Scrabble player is extremely well-served to learn what serious players call “the twos.” There are only about 100, depending on the Scrabble dictionary you use, and you probably already know at least half of them. The rest can be learned quickly — on the subway, in line at Starbucks or in a staff meeting. 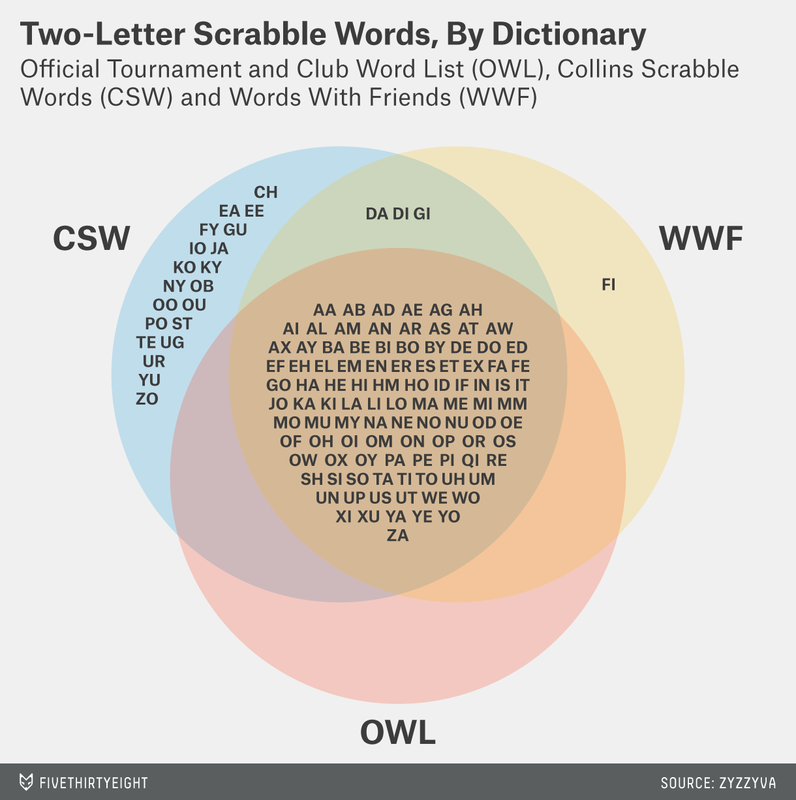 Scrabble expert John O’Laughlin has developed the metric of “playability.” For the sabermetric-minded, think VORW — Value Over Replacement Word. By having the artificial intelligence Scrabble player Quackle play itself many, many times, he’s calculated, essentially, which words would hurt your score the most if you didn’t know them. The vast majority of the words on the top of the playability list are two letters long. Because of licensing issues, the body that governs competitive Scrabble tournaments in North America, the North American Scrabble Players Association (NASPA), hasn’t released a complete list of the additional words to the public. But some enterprising Scrabble players — including the Seattle Scrabble Club and others on Facebook — have taken it upon themselves to construct such a list by hand, by combing through the hundreds of thousands of words in the hard copy of the new dictionary, first made available for sale at the recent National Scrabble Championship, and the website of Merriam-Webster, which works with NASPA to create the official word list. For similar reasons as the two-letter words, three-letter words are also important for scoring in Scrabble. According to the Seattle club, there are 66 new threes. The new big scorers (with the letters J, X or Z) are AJI, CUZ, MUX, REZ, SEZ, TIX, TIZ, WUZ, XED and YEZ. There are apparently no new three-letter words containing a Q. There are reportedly 185 new four-letter words as well, and about 5,000 new words total. A work-in-progress list is up at the Seattle club’s website. Can’t handle this dialectal deluge? You’ve got three months to learn the new words. Have a mojito and chillax.